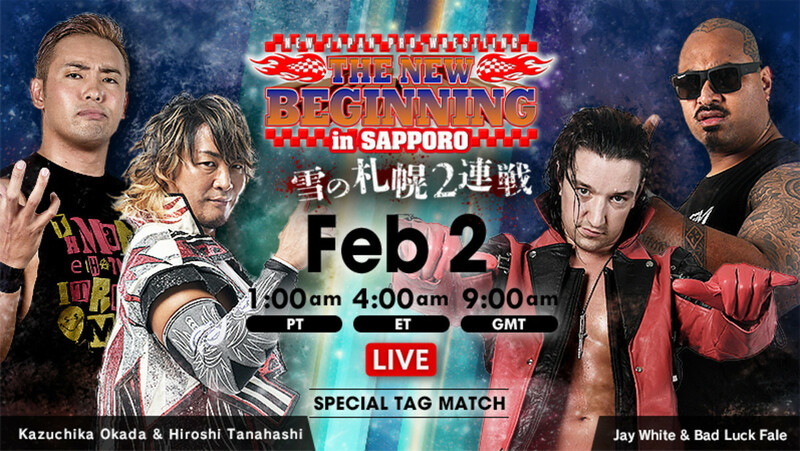 The first of three New Beginning shows take place this morning in Sapporo, with the key matches being more of a preview for the other two cards set to take place this month. In the main event, Kazuchika Okada and Hiroshi Tanahashi will team up to take on Jay White and Bad Luck Fale. This will serve as a high-profile preview for their upcoming singles bouts on 2/21, with Okada facing Fale and White challenging Tanahashi for the IWGP Heavyweight title. There will also be two singles matches featuring the participants in the IWGP tag team title match on 2/3. EVIL will take on Zack Sabre Jr. in the co-main event, while SANADA will face Minoru Suzuki. Join us for live coverage of the show starting at 4 a.m. Eastern. There will be English commentary for both weekend shows, with Kevin Kelly and RevPro announcer Andy Simmons calling the action. This was a slightly better and longer version of the match that these two had on the January 29 show. A really good opener. I've been impressed with Uemura of late. They exchanged standard Young Lion offense. Both sold well. Narita took the victory with a bridging belly-to-belly. This was a showcase for Umino, more than anything. His offense looked great. His selling was excellent. His intensity was on point. Good stuff. Umino got some early offense in on Henare, and earned a nearfall off a tackle. Henare was able to tag Nakanishi, who took control of the match for his team. Nakanishi hit some clubbing blows, and used a splash for a nearfall. Yoshida got a tag, and hit a vertical suplex on Nakanishi for a two count. Nakanishi hit a lariat for a nearfall. Henare and Umino got tags. Umino hit a suplex for a nearfall, then applied a cross armbreaker. Henare rolled to the ropes. Umino hit a missile dropkick off the top. He went for a fisherman buster, but Henare blocked it. Umino applied a flying armbar that threatened to end the match, but Nakanishi broke up the hold. Henare and Yoshida brawled to the floor. Henare hit a Samoan drop for a two count, then hit a big spear for another. Henare used a uranage for the pin. This wasn't very good. They're preparing for Iizuka's retirement show later this month and trying to put a little steam behind this Iizuka/Tenzan thing to make the retirement show meaningful. It's hard to be too critical given that they're trying to give a veteran a nice sendoff. Tenzan cut a promo before the match and said he wants to go one-on-one with Iizuka once more before Iizuka retires. Iizuka attacked him before the bell. This broke down into a standard Suzuki-gun ringside brawl right away. Iizuka used a chair on Tenzan. They teased a countout, but Tenzan RACED back to the ring as fast as he could, which was not very fast, to beat the count at 19. Iizuka and TAKA took turns working over Tenzan. Tiger got a tag and hit a high cross, but TAKA rolled through for a two count. Tiger used a crucifix hold for a nearfall, but it was quickly back to Iizuka and TAKA working him over. Tiger hit a Tiger Driver, but Iizuka broke up the ensuing pinfall. Tenzan tagged in and hit a brainbuster, but TAKA kicked out. Tenzan hit a mountain bomb for a two count, then used the Anaconda Vice. Iizuka broke up the hold with stomps. Iizuka and Tiger brawled on the floor. In the ring, Tenzan teased a moonsault, but Iizuka jumped in with a chair for the DQ. Iizuka attacked Tenzan with the iron glove after the bell. Tama Tonga's "Good Guy" shtick is really funny, but it's taken away whatever edge his character had and made him a comedy act. I'm not sure if that's good or bad. At least it seems he's having a good time. Tonga and YH did some spots. Honma and Owens tagged in. Honma hit the ropes, and Jado hit him with a kendo stick from the floor. Owens worked Honma over while the other eight guys brawled on the outside. Loa and Yujiro got tags and continued assaulting Honma. Tonga hesitated when given the chance to attack Honma, allowing Honma to hit a suplex and tag out. Ishimori and Taguchi got tags. They traded ankle locks. Ishimori reached the ropes. Ishimori hit a handspring kick. Makabe and Loa tagged in. Makabe hit ten punches in the corner. He teased a northern lights suplex, but Loa cut him off. Loa blocked a lariat and hit a headbutt. Makabe was finally able to connect with a lariat, and tagged Yano in. Loa hit a neckbreaker, then tagged Yujiro. Yujiro, Ishimori and Owens worked over Yano three on one. Yujiro hit a fisherman buster for a two count. YH jumped in for a lariat. Owens hit a backbreaker. Honma hit a kokeshi. Makabe hit Tonga and Loa with a double lariat. Taguchi hit a hip attack on Jado, then hit Ishimori with a plancha. Yano used a low blow and a schoolboy on Yujiro for the pin. This was just kind of there. Naito didn't do much, saving himself for the IC title match tomorrow. Despy and Kanemaru attacked Shingo and BUSHI before the bell and brawled to the floor, leaving Taichi and Naito to face off in the ring. Taichi offered a handshake. Naito offered a fist bump, then spit in Taichi's eyes. They both hit tranquilo poses. Desperado and BUSHI tagged in. BUSHI hit a flying headscissors, and Shingo jumped in for the illegal double team. Shingo tagged in legally, and continued to work on Desperado. Desperado came back with an eye rake. They traded chops. Shingo hit the ropes, Kanemaru tripped him from the floor, then pulled him outside. Kanemaru hit a legdrop as Shingo was draped over the barricade. Taichi threw Naito over the barricade and sent him flying into the audience. Taichi slipped while hitting Naito with a chair. Back inside, Taichi teased hitting Shingo with Naito's title belt, but decided against it. Suzuki-gun cut the ring in half and went to work on Shingo. Shingo came back with a brainbuster on Kanemaru, and made a tag to Naito. Naito cleared the apron, then hit a dropkick in the corner on Kanemaru. Kanemaru tagged Taichi, who attacked Naito with a series of kicks. Taichi hit an enziguri, while Desperado and Kanemaru cleared the apron. Taichi removed his pants. Taichi hit a dropkick, into a double down. Naito tagged BUSHI, while Kanemaru and Desperado jumped in. BUSHI took them out, then went for an MX on Taichi. Kanemaru spit whiskey in BUSHI's eyes while Taichi took the ref. Taichi hit BUSHI with a lariat for a nearfall. Taichi followed with a high-angle suplex, then covered for the pin. Desperado unmasked BUSHI after the bell. Miho Abe put the mask on. Taichi posed with Naito's belt. This was very good. They worked a slower pace, but it worked well. Suzuki went for a running kick right off the bat, but SANADA blocked it. They traded side headlocks. SANADA went for the paradise lock, but Suzuki fought it off. He went for it again, but Suzuki turned it into an armbar. SANADA used the armbar to successfully apply the paradise lock, which got a great reaction. SANADA broke the hold with a dropkick, which allowed Suzuki to attack with kicks. SANADA rolled outside, and Suzuki hit him with a PK from the apron. Suzuki turned it into a brawl around ringside. Suzuki used a chair shot to the back. Suzuki left SANADA buried under a stack of chairs and barricades. Suzuki had a cut on his cheek. SANADA beat the count back inside. Suzuki used a kimura, but SANADA was able to reach the bottom rope. Suzuki lit SANADA up with kicks. They traded chops. SANADA went for a dragon screw, but Suzuki turned it into an armbar. SANADA again reached the ropes. Suzuki worked on SANADA's right arm. SANADA dodged a kick, hit a dropkick to the knee, then a dragon screw. SANADA hit a leapfrog dropkick, then a plancha as Suzuki rolled outside. Back in the ring, Suzuki hit a PK and earned a nearfall. They exchanged chops again. SANADA went up and over into the corner. He went for a springboard dropkick, but Suzuki cut it off and used a rear naked choke. Suzuki went for the Gotch Piledriver, but SANADA slipped out and applied Skull End. He didn't have the hold fully applied, and gave it up. SANADA went for a moonsault, but Suzuki got his knees up. Suzuki sold the damage to his knees while they exchanged more strikes. Suzuki hit a huge forearm, dazing SANADA. Suzuki hit two more big shots, dropping him. The crowd had been quiet for some time, but they really got into it here. Suzuki hit a bunch of palm strikes to the face. SANADA hit the ropes, and bounced right into a dropkick from Suzuki. Suzuki hit another series of strikes. Suzuki used a rear naked choke, then transitioned to the Gotch Piledriver. SANADA fought it off, and backdropped out. They used a series of misdirection spots. SANADA used a European Clutch for a nearfall. SANADA escaped another choke, and applied Skull End. Suzuki slipped out, applied another choke, then hit the Gotch Piledriver for the pin. I would have put this on before the previous match. The pace was even slower than the Suzuki match. Sabre is a master at what he does, but that doesn't always translate to exciting matches if he doesn't have the right opponent. The last couple of minutes were great, but this dragged in spots. They exchanged holds at the outset. Sabre was not able to lock on anything of significance, and the sequence ended with EVIL hitting a shoulder block. EVIL controlled a knuckle lock, stretching Sabre. EVIL maintained wrist control. Sabre finally flipped out and countered with a heel hook. EVIL reached the ropes. Sabre sold the damage to his arms from EVIL's stretching. Sabre attacked both of EVIL's arms with stomps. Sabre applied a wristlock over the ropes. Sabre attacked EVIL's right arm with kicks. Sabre hit a pair of uppercuts. He raked the face, then torqued on EVIL's neck with his legs. Sabre used a cravate. EVIL transitioned to an abdominal stretch, then hit a sidewalk slam. EVIL used a wristlock, but Sabre reversed it into Hurrah! Another Year, Surely This One Will Be Better Than the Last! The Inexorable March of Progress Will Lead Us All to Happiness!, before EVIL reached the ropes. Sabre used a triangle, but EVIL powerbombed out. Sabre rolled to the apron, and EVIL hit him with a shoulder tackle, knocking him to the floor. They brawled to the ramp, and EVIL hit a fisherman buster. They beat the count back inside. EVIL hit Darkness Falls for a two count. He went for Everything is EVIL, but Sabre escaped, and hit a PK. They exchanged strikes. EVIL dropped Sabre with a forearm, then a double sledge to the chest. EVIL hit a big lariat in the corner. Sabre came back with a mid kick, then hit a PK for a two count. Sabre used a one-arm guillotine. He went for the Zack Driver, but EVIL escaped and hit a kick. EVIL hit another corner lariat. They went to the top rope. EVIL went for a superplex, but Sabre used an abdominal stretch. They traded strikes, still on the top rope. EVIL hit a superplex. EVIL hit a lariat for a two count. EVIL went for Everything is EVIL, but Sabre turned it into a European Clutch for a nearfall. Sabre hit a PK, then used a rollup into a bridge for a two count. EVIL blocked a kick and hit a headbutt. EVIL hit a lariat. After a series of reversals, EVIL hit Everything is EVIL and got the pin. White and Tana started off. They locked up. White backed Tana into the corner, but broke cleanly. He went for a right hand, but Tana ducked and grabbed a side headlock. Each pulled the other's hair. Tana hit a second rope springboard crossbody, then tagged Okada. Okada and Tana both hit sentons. White backed Okada into the corner, and made a tag to Fale. Fale whipped Okada into the corner. Okada slapped on a sleeper, and jumped on Fale's back, but Fale slammed him off. Fale and White took the fight to the floor. Fale choked Okada with a towel, and White used a camera cable to choke Tanahashi. White left Tana laying in the aisle, buried under pieces of barricade. Back inside, Fale slowly worked over Okada. Fale sent Okada to the floor, and White sent Okada into the ring frame and the barricade, repeatedly. White got a tag and picked up a nearfall on Okada. He knocked Tana off the apron, then used a single-leg crab on Okada. Tana jumped in to break it up. Fale sent Tana over the top rope to the floor, then tagged in and went to work on Okada. Fale and White cut the ring in half, and worked Okada over. White used a chinlock. Okada broke free, then made a tag. Tana hit a flying forearm on White, then knocked Fale off the apron with a leg lariat. Tana hit a somersault senton from the second rope for a two count. Tana ran into a pair of chops from White. White grabbed a waistlock, then hit a chop block on Tana's right leg. White hit a Saito suplex, then tagged Fale. Fale went for a suplex, but Okada jumped in, cut him off, and Okada and Tana hit a tandem suplex on Fale. Okada got a tag and hit Fale with a back elbow and a DDT. Okada slammed Fale. Okada went to the top, but Fale cut him off. He hit a Samoan drop and a big splash for a two count. Fale went for a Grenade, but Okada hit him with a dropkick. Okada escaped a Bad Luck Fall, but Fale hit him with a tackle into a double down. White and Tana got tags. They traded strikes. White kicked at the right knee. Tana hit Slingblade for a two count. Okada and Fale brawled to the floor. Tana went for a cloverleaf, but White escaped. Tana hit a Dragon Screw. Fale jumped in, but Okada hit him with a dragon screw. Tana ran the ropes, but Gedo tripped him. White hit a flatliner, then a bridging suplex for a two count. Tana hit Fale with Slingblade. Okada hit a dropkick on White. Okada hit a Tombstone on White, and handed him off to Tana, who hit a Styles Clash. Okada hit a top rope elbow on White. Tana went to the top for High Fly Flow, but Gedo cut him off. Fale hit Grenades on both Okada and Tana. White picked up Tana and hit a DVD for a nearfall. White went for the Blade Runner, but Tana turned it into Twist and Shout. Fale also ate a Twist and Shout. Gedo passed White a chair. White swung it, but Tana ducked and hit Slingblade. Tana hit Fale with a suplex, then decked Gedo. White hit Tana with the chair, then hit a series of dragon screws. White used an inverted figure four. Okada tried to break it up, but Fale hit him with a splash and a Bad Luck Fall. With Okada taken out, Tanahashi tapped out to the inverted figure four. White kept the hold applied after the bell. White cut a promo running down Tanahashi, hit him with a Blade Runner, and posed with the IWGP title to close the show.